In today’s signage world people expect information to be current. Outdated information is usually the result of a signage system that is too much work to keep updated. Designing content on your display should not only be about how great it looks but also how it can keep current and relevant. A menu with the old prices or a progress report with last months values is not the impression you want any viewer to have about your accountability. 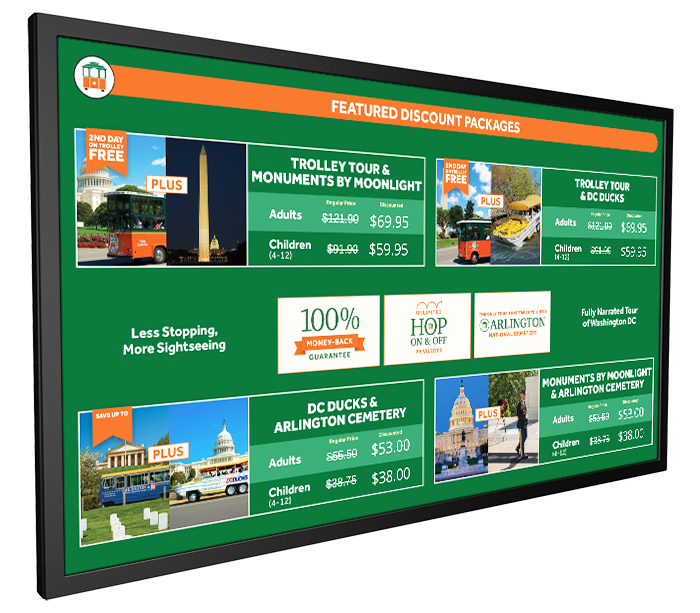 Using Google Sheets in Digital Signs will feed your screens the dynamic content you can count on. Also knowing how you will keep this content current is necessary. Digital signage that my clients can’t control or keep updated is just another outdated poster being ignored. As a designer it is my role to also think about how to best integrate and automated content easily while still making it look amazing – Google Sheets in Digital Signs can make this happen. Plus Google Sheets in Digital Signs is a powerful tool that anyone can use. By taking advantage of this widget you can have ticket prices that change by simply typing new values into your spreadsheet. Have multiple employees control a list that updates regularly from a shared spreadsheet. Even display your company stock price that automatically updates through Google’s built in Finance options using sheets. In fact there are 3 common uses of the Google Sheets widget. Prices and menu items are going to change – what if you are sold out of an item that day? Now you don’t need to worry about the time it will take to redesign or paying your designer to make graphic updates. Simply open your Google sheet and change your menu item in seconds. Now for that sold out item….Instead of having frustrated customers your store manager can change the price to “Sold Out”. Displaying relevant markets for your industry and presenting your companies stock values must have current numbers – your viewers expect it. Customized programming or paying for a stock feed service are no longer needed. Google Sheets has a built-in function called GOOGLEFINANCE which fetches current or historical securities information from Google Finance to a Google Sheet. Then the Arreya widget links that information into your signage. Options for what you can display are many https://support.google.com/docs/answer/3093281?hl=en and there is flexibility to style these numbers will give you that custom stock board you are after. Data is powerful and people react to change. You can now have a display communicating frequent changes to your totals – which creates a positive impact with those viewing your signs. You can’t afford your signage to fall behind so being able to easily change that running total in the moment is important. You can now quickly enter new values, even assign others to also update values. From employee sales goals, to web site hits, and how many sign ups you can have live updating feeds. 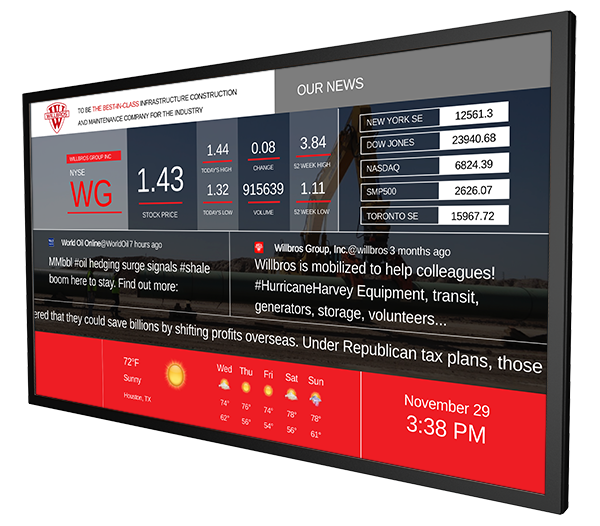 Equally important is that it’s easy to run Google Sheets in digital signs without any coding or complicated set up through the Arreya Widget. First set up your content in Google sheets – Organize into columns and rows. Each cell of content will then be linked into your sign. Even take advantage of Google’s Data Integration like finance. Then publish your sheet to the web and copy the link – A concern people have is security. The link provided does have a security token in the web address, which means it is unlikely that others could accidentally come across the file. It cannot be searched. You need the exact link to view the content and Arreya does not display this publically. However we do not recommend using sensitive company data for this use. Next place the Google Sheets widget into your layout – Paste the link into the widget and assign which cell you want displayed. Let’s say you want Cell A3. Then whatever is typed in that cell on your Google Sheet will then display in your layout. Simply style and size that content and position A3 into the layout. If you have multiple items to show you will repeat this step and can place as many widgets on your page as you need. Once your layout is complete you can push live and exit Arreya. And for future signage updates – Making changes can just be made by entering new values in your Google sheet which then automatically feed your screen. 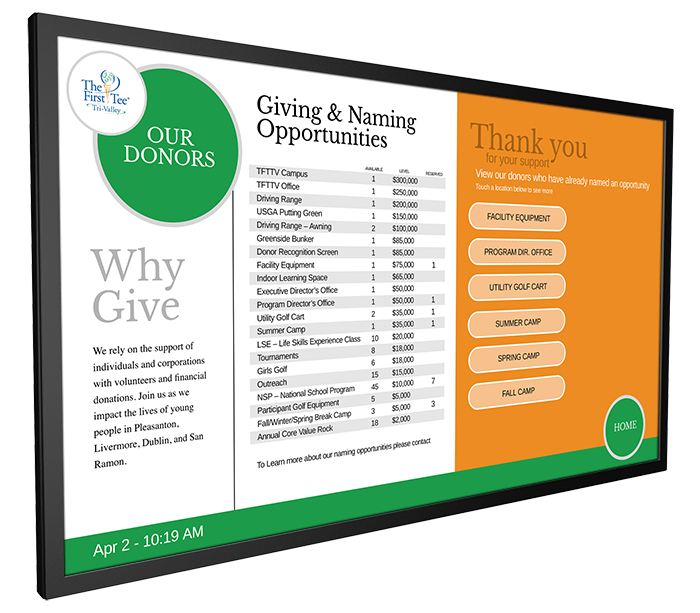 Even share your sheet with other individuals to give them the ability to update the digital signage without ever having to worry about learning a new program. Indeed thinking about all the ways I can use Google Sheets In Digital Signs is exciting. As a designer it gives me another trick for creating amazing signage. Then again tricks are intended to deceive… what I really have is a bag filled with super signage powers and it is my job to decide what to use to best control content. Being able to integrate Google Sheets in Digital Signs is powerful, it’s a program familiar to so many and offers so much opportunity to handle content in so many ways. So start feeding current content using Google Sheets… It’s the super signage thing to do!